“The last link” for an unprecedented era of domestic rice production was unveiled yesterday (Monday, Sep 25) with the inauguration of Trukai Industries’ new hulling mill at its main operations base in Mataram Street, Lae. Vice Minister for Agriculture and Livestock and Member for Goroka, Hon Henry Ame inaugurated the mill and led a host of dignitaries including Trukai management and Chairman Mr Mark Robertson. In what was a historic moment for rice farming in PNG, the mill opening marks a critical step in establishing Trukai’s holistic paddy-to-plate value chain, which connects commercial quantities of locally grown rice with PNG consumers via a 100% fully integrated domestic production process. The commercial quantities of rice grown in projects such as Trukai’s plantation partnership with the Chingwam Rice Growers Cooperative, supplemented with smallholder-grown rice, gives market access and new opportunities to local farmers. 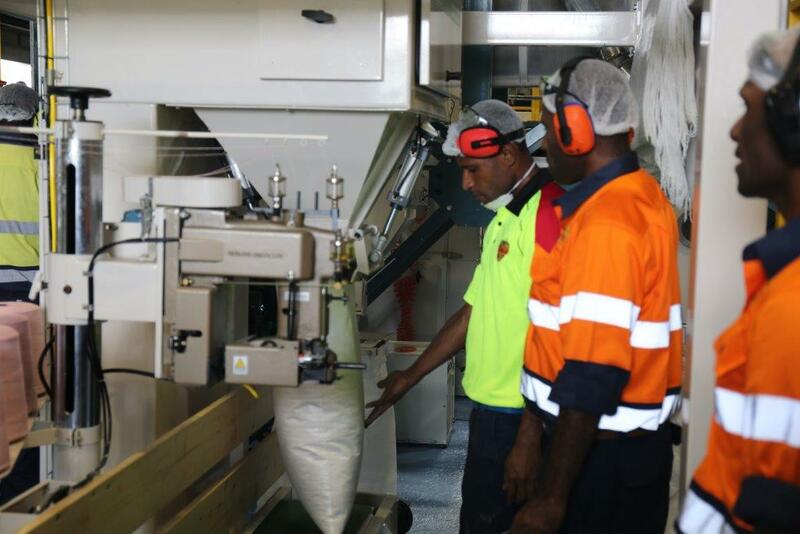 The first of its kind in PNG, the mill sets Trukai apart as the only company with the capability to provide consumers bona fide, PNG-made rice produced from a total, end-to-end local process. It closes the circle of Trukai’s unique value chain and involves seed and site research, planting, growing, harvesting, milling, packing and distributing domestically grown rice. It will provide the capability to process locally grown rice initially grown in the Markham Valley, as part of Trukai Industries’ Markham Valley Rice Corridor Plan. The plan incorporates rain fed and irrigated rice from National Agricultural Research Institute (NARI), its primary site at Chingwam where its rice development team will be planting 325 hectares in November/December this year. A number of smaller sites along the Highlands Highway between Umi and Lae will also be developed. Hon Mr Ame cut the ceremonial ribbon to open the mill before it was switched on for processing, the rice used in its initial run being 130 tons of rice grown in Trukai’s trial crop at Chingwam, harvested in April/May this year. The rice will be used for Trukai’s popular ‘Roots’ blend. Trukai Industries CEO Mr Greg Worthing-Eyre was delighted with the milestone, and sentiments shared by Hon. Mr Ame in his address. “This event marks an important moment in the development of a local rice industry for PNG, as it provides the last link in a large scale vertical integration process which gives PNG an end-to-end solution for domestic production of rice,” he said. There will be additional employment opportunities within the mill but the main impact will be in the economic flow-on benefits of establishing a viable new industry in rural areas, providing new employees with disposable income to promote secondary business.